2008 10/11 Year Old All-Star Baseball District 4 Champions! 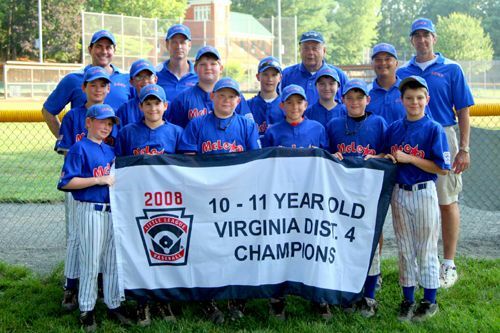 The McLean American 10-11 year old All-Star baseball team won the District 4 Championship, sweeping through the tournament with four straight wins. In three of the games, McLean came from behind to win. In the opener, McLean rallied from a 0-2 deficit to win 5-2 over Vienna National. In the first game, Cam Hester hit the first of his three home runs. He was walked intentionally four times during the tournament. In the second game, McLean had 16 hits to out slug Falls Church 13-10. In game 3, McLean beat the Vienna Colonial squad that had not been scored upon previously, winning 7-6. Jameson Culp, Caleb Beatty and Cam Hester led the attack. In an incredible final, McLean American faced Alexandria, the winner of the losers’ bracket. Alexandria took a 9-1 lead after 2 innings by excellent hitting from the Alexandria players, including a grand slam home run by Antonio Diz. McLean fought back but still trailed 9-7 going into the top of the 6th inning. The team rallied to bat through the order in the top of the sixth to go ahead 10-9. William Rau pitched well and recorded the win, while Matthew Spidi recorded the save. On July 25th, McLean American begins play in the Virginia State Tournament in Virginia Beach. The first game is Friday at 3 p.m. again Louisa. The McLean American team headquarters are at The Oceanfront Inn. This is the first McLean baseball team to win a District 4 title in 5 years.